Hello! Happy May! Love May, May makes me happy. Proper spring you see, it’s magic! Plus it’s my birthday in a couple of days and that always gets me giddy (I can’t believe I still get excited about my birthday). 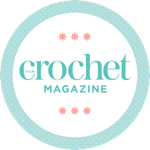 It’s been a while since I wrote a post about crochet. They’ve all been videos haven’t they?! I’m starting to see a divide between blogging and vlogging, that I had no idea about. It’s not a problem but I’d like to not neglect anyone. Anyway… blanket. 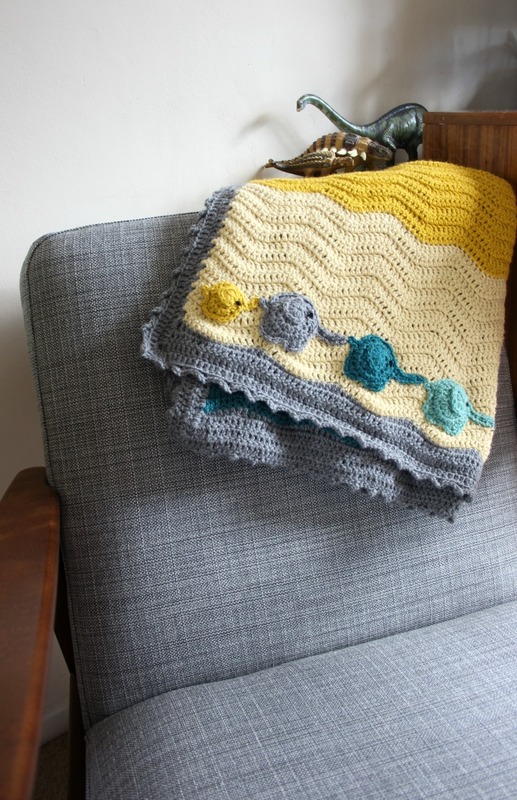 At the beginning of April a friend got in touch with me and asked very nicely if I would make a baby blanket for her friend. I liked the ideas she had and fancied having a go at something different. It was nice that I could do a brainless ripple but there was also going to be something interesting in the mix as well. 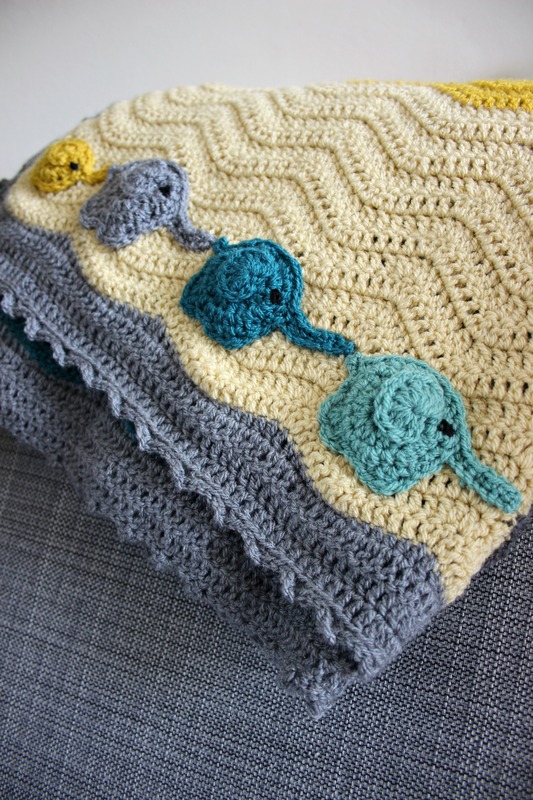 I know that the baby in question is having a safari themed nursery and because grey was to feature in the blanket’s colour palette, it was elephants that sprang to mind. I did a quick search online and came up with these cuties. The pattern is from Repeat Crafter Me and it’s exactly the sort of thing I wanted. I like how the secret elephants are hidden inside when it’s folded up. You might think it’s a boring blanket. But tumble it open and the cuteness is revealed! They had to go trunk to tail, that’s something I definitely wanted. I hadn’t thought much about how they’d be attached. I’m glad it dawned on me not to merrily stitch through to the other side. I paid lots of attention to making the stitches only on one side. I had to forgo safety eyes for the same reason (they’d poke right through to the other side). I forgot to take pics of the other side to prove that there’s nothing on show. Watch my latest vlog, the evidence is there! 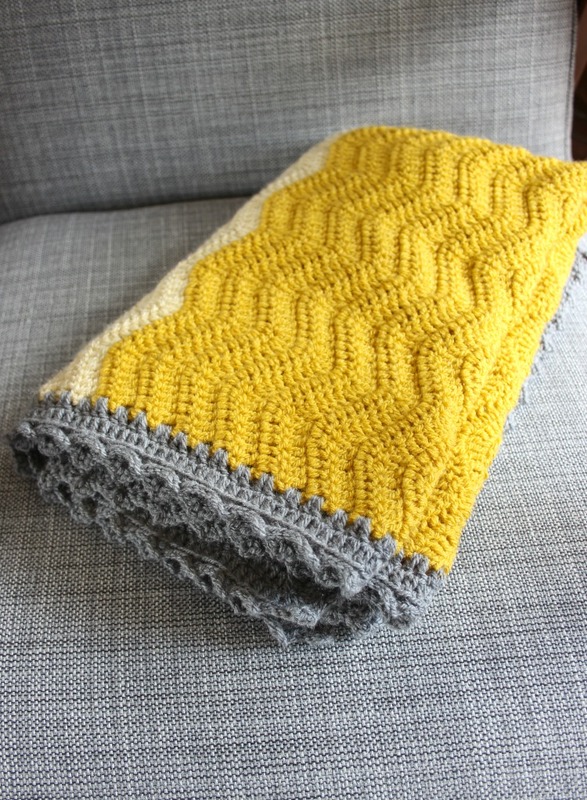 I used Stylecraft Special dk as it’s perfect for baby blankets. I ordered the yarn at the same time as the release of the new shades so I knew Buttermilk had to be part of it. It’s like someone has added mayonnaise to the Mustard. They go very nicely together. Also in the mix are Teal, Sage and Grey. It looks quite nice on my fabulous(ly cheap) sofa too! And let’s not forget the ubiquitous Neat Ripple! I have no idea how many times I’ve made Attic 24’s Neat Ripple! So many! I did 8 pattern repeats and 64 rows before adding the grey. At each end I added a ripply row of grey and then a straightening row. You can straighten it off by following this useful guide from Little Tin Bird. Then it was just a case of making a couple of rounds of UK trebles before going back to Attic24 for the edging, which was pilfered from Lucy’s original Granny Stripe. Phew! What do you think? I like it! Anything with grey and mustard floats my boat though. Grellow they call it. 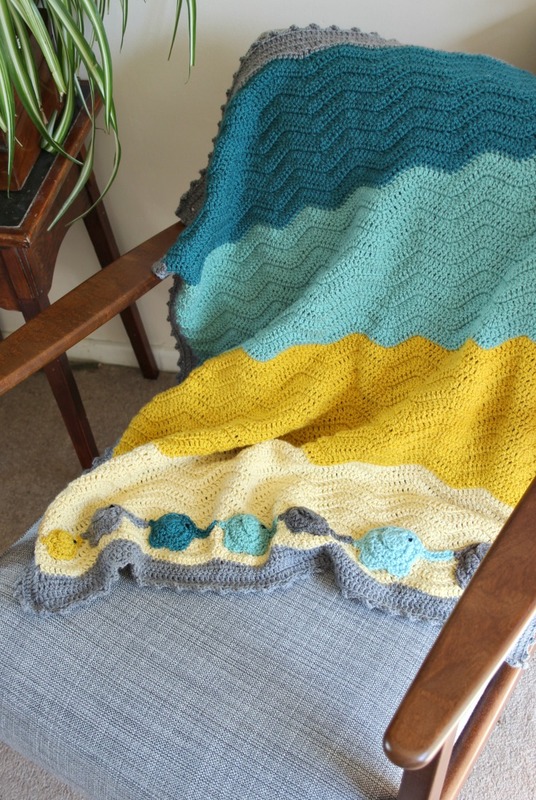 I absolutely love the colours of the blanket! Thank you so much! The elephants make it! Those elephants are the cutest! 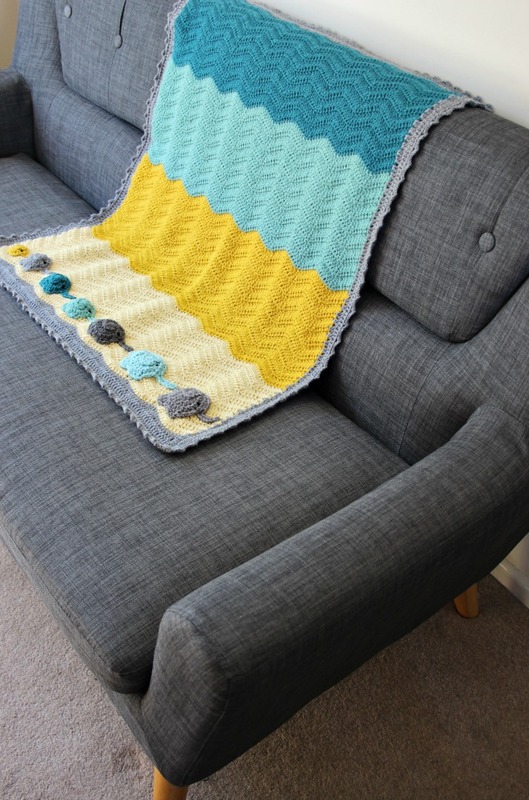 What a lovely baby blanket! Heehe, I agree! Thank you very much! 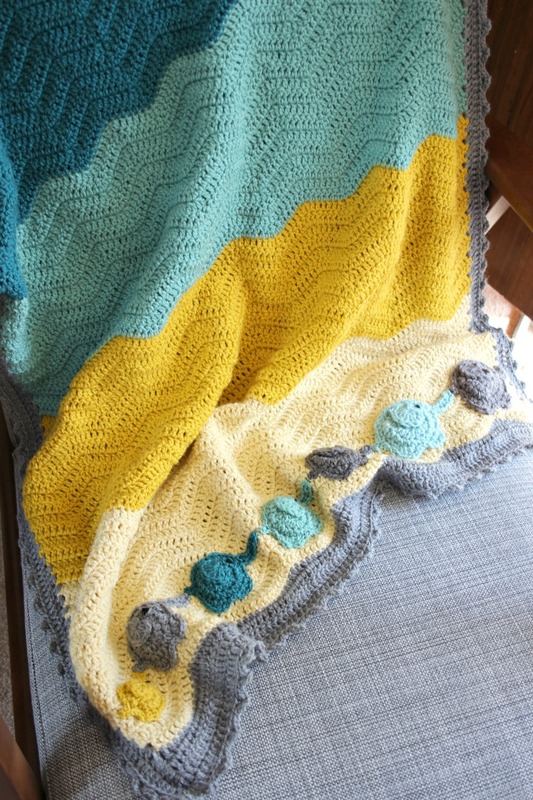 What a beautiful blanket, it’s gorgeous! 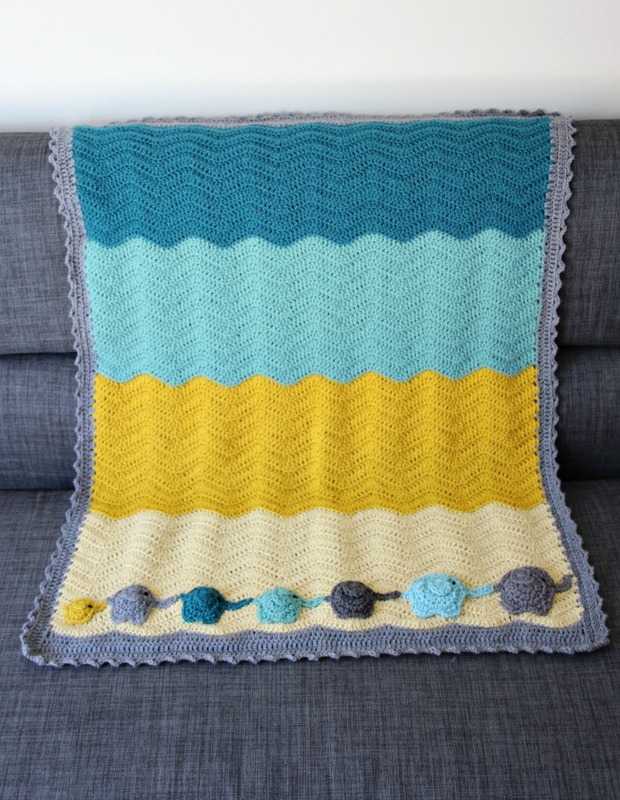 What a delightful blanket! The little elephants are so cute! 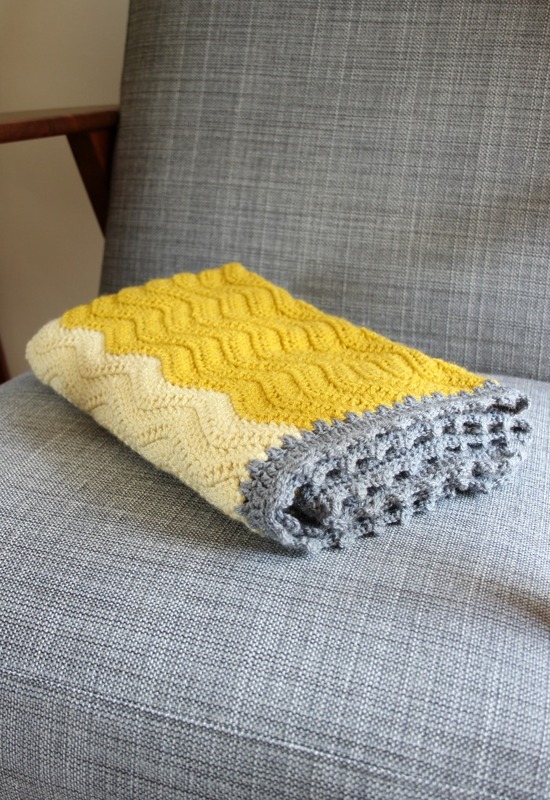 I really, really must do a ripple blanket myself…. they look so lovely! Thank you! Yes, make one! 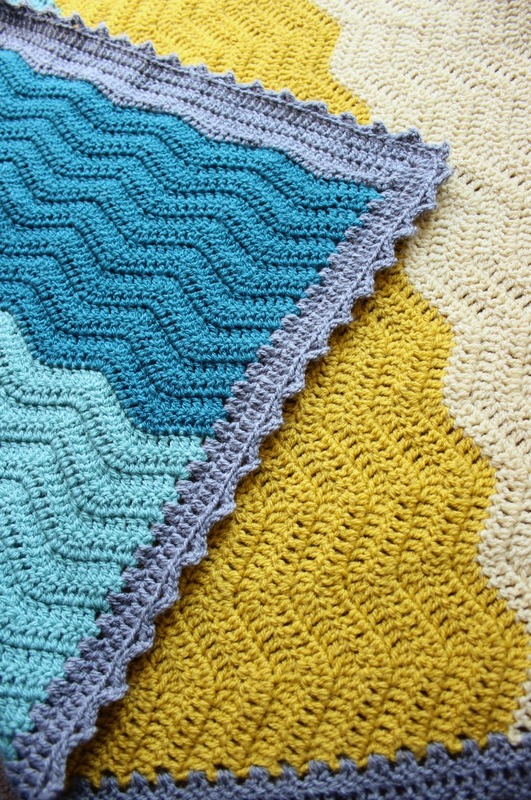 They’re super easy (especially after the first couple of rows!). All those great colours, and elephants too? That’s one lucky baby! I’m also a big fan of the grellow… It’s what I reach for when anyone says I wear nothing but black! Ah, thanks for that! On of my next projects will be grellow too. I’m gonna make myself a jumper! !